What's the story with these guys standing up and paddling on surfboards? There is a buzz in the local waters, Stand Up Paddle Surfing. What is it and where did this come from? 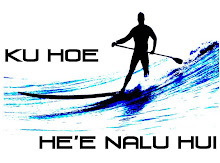 Ku Hoe He'e Nalu in the basic, most elementary translation is: to stand-to paddle-to surf-wave. This is surfing, the sport of the Kings (hence "kingz of the coast"). Prior to this year there have been a few newspaper articles written, a couple spots in some of the surfing magazines, maybe a video shot here or there, a blog here or there and one or two websites that give limited information about the sport of Stand Up Paddle Surfing. Now it's a whole new virus and everyone is catching it! This worldwide segment of surfing known as Stand Up Paddle Surfing was made popular back in the Waikiki Beach Boy days of the 1960's. Stand Up Paddle Surfing, gets the alias of "Beach Boy" surfing from those days in Waikiki when the Beach Boys would stand up on their longboards and paddle with outrigger paddles while taking pictures of the tourists surfing on vacation. Documented "modern" Stand Up Paddle Surfing dates back to the 1940's with the great waterman Duke Kahanamoku and a crew of Beach Boys. However, Hoe He'e Nalu predates even Duke, to the ancient Polynesian paddlers. The roots of royalty are what you experience when gliding and sliding as you Stand Up Paddle Surf. On a side note- the term "Beach Boy" comes from when Duke was a teenager and bailed on school to hang out with the other braddahs down a the hau tree at Waikiki Beach. Duke is known as the father of modern surfing, the ambassador of aloha and the one who made Waikiki "Beach Boys" famous. So this "new" idea is really one of old and is making a revival. In Hawaii, Stand Up Paddle Surfing is really starting to be seen all over in the islands...and in between them. Hawaiian watermen, such as Dave Kalama, Brian Keaulana, and the others mentioned here, are actively pushing the sport forward with channel crossings, down wind runs and Stand Up Paddle Surfing being added to events like Makaha's Big Board Surfing Classic in 2004. Also in 2004, Archie Kalepa entered the Molokai to O'ahu Paddleboard race as a Stand Up Paddle Surf entry. He finished the 32 mile race in 6 hours. From what can be told he was the first to cross that channel solo by means of Stand Up Paddle Surfing. Laird Hamilton has paddled from O'ahu to Kaua'i, Catalina to Dana Point, the English Channel, even the Grand Canyon, and has Stand Up Paddle Surfed Jaws and Teahupoo. Currently in Southern California, we are promoting the sport and more importantly the spirit of this regal and majestic Pacific Islander tradition. With the hopes to broaden the perspective of other watermen and water-wahines worldwide. Paddle with Aloha. Hello, I recently launched an SUP specific affiliate network. I see you already have a few affiliate links on your site. I would be honored if you would consider joining my affiliate network. You can learn more at http://www.standupaffiliate.net. Feel free to contact me with any questions.